We’ve often expressed our view that the true core features associated with dyslexic minds are their strengths. In other words, the reading, spelling, and other academic challenges that people usually think of as the essence of dyslexia are really “side effects” of having a mind that’s wired to be good at other things. If that’s true, then it should be possible to identify people who are likely to have “dyslexic reading and spelling challenges” by screening for people who show the characteristic strengths associated with dyslexic processing. In other words, we ought to be able to spot the same group of “dyslexic people” by screening for “dyslexia-associated strengths” as we do for “dyslexia-associated challenges”. Over the past week we’ve started the process of better characterizing dyslexic strengths by distributing the M-Strengths survey that now has almost 1000 participants. (THANK YOU!!!!) And even though this is only one of the 4 MIND-Strengths we’ll be testing for, we can already begin to give you an idea of how “strengths-based identification” will work. Who Took The M-Strengths Survey? 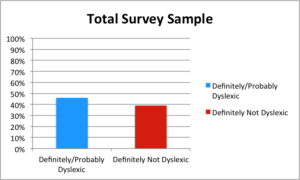 We won’t go into detail, but the “probably dyslexic” group tested just like the “definitely dyslexic” group, so we’ll cluster both of those together for our “dyslexic” number. [The “possibly dyslexic” group scored in between the non-dyslexic and dyslexic groups, so we won’t be mentioning them further.] 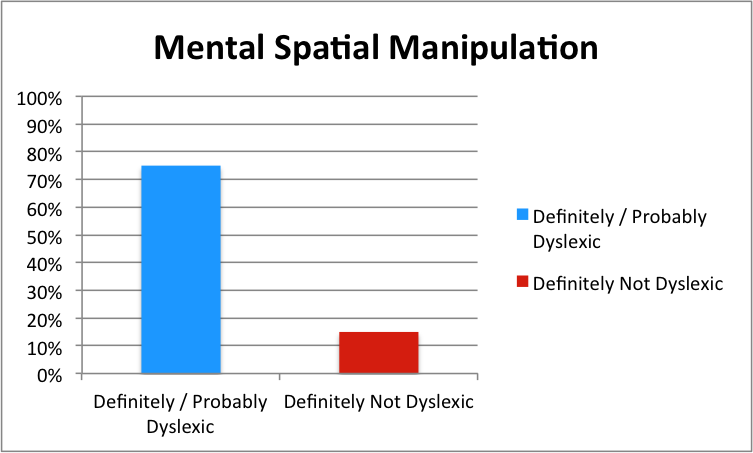 So as you can see, we began with 47% dyslexic test-takers, and 39% non-dyslexic ones. As you can see, our group has gone from 47% to 75% dyslexic, and from 40% down to 15% non-dyslexic. 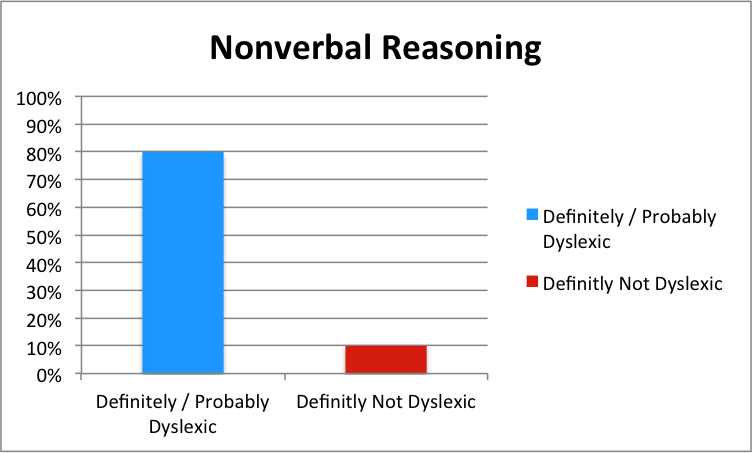 [Although the numbers aren’t shown here, we’ve still kept 72% of our dyslexic group, but only 16% of our non-dyslexic participants.] So by applying a screening question based entirely on strength, we’ve really enriched our remaining group for dyslexic people. 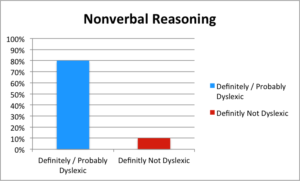 Our remaining group has now increased to over 80% dyslexic, and less than 10% non-dyslexic, and we haven’t so far used a question that has anything to do with reading or spelling! 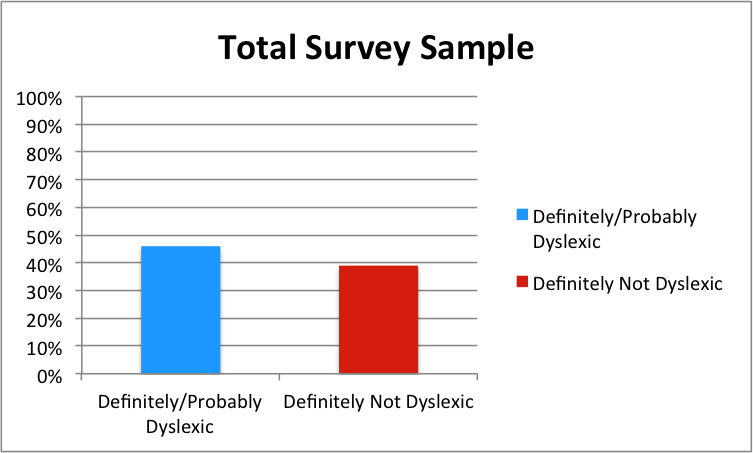 Further, we’ve still kept 64% of our dyslexic respondents, and only 9% of non-dyslexics. Hopefully this will begin to give you an idea of the potential power of this strength identification process as we move ahead with the process of further identifying dyslexia-associated strengths. Clearly these surveys will allow us to help individuals better identify their own strengths. That’s incredibly important, and we’ll be able to provide specific information along these lines very quickly. But this process should also help us reframe way we think about what really best characterizes this group of people, and how we understand what’s important about having such minds. Remember: we can classify things in all sorts of ways, but we should make sure that our classifications are really getting at the most important features. For example, we can do a pretty good initial screen for pro basketball centers by looking for “People who can’t fit in subcompact cars”. But we shouldn’t get so hung up on the implications for travel that we forget the benefits of being tall. It sounds like a step forward and testing more people be experienced in the right and fair away that they have dyslexia people are still not getting the help they need and being let out i’m one of them.